Moles are small mammals difficult to see ears and eyes, reduced hind-limbs; and short, powerful forelimbs with large paws positioned for digging. And that’s what they do, dig. Moles are not a dangerous animal to humans but they can be very damaging to your lawn or landscaping. 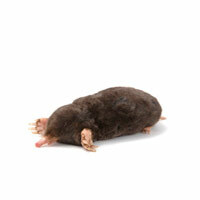 A single mole can turn a nice lawn into a mess of tunnels and dirt piles in a short time. No important diseases associated with moles. The best way to rid a mole problem is by using special mole traps. Types of mole traps include spear traps, scissor traps, and body clamp traps. Mole trapping can be very challenging as it is crucial to place the traps in the active tunnels in the right spots. If the traps are not set correctly they won’t be effective. Quick Catch has the experience and knowledge to assess the mole problem, set the traps correctly and resolve the mole issue in a decent amount of time.